We are delighted to announce the opening of USAMI Masahiro’s exhibition “Manda-la” on Friday 13th February. This will be the first solo exhibition of Usami, an emerging artist who has already attracted significant acclaim. The title “Manda-la” was chosen in the image of the mandalas crated by Buddhist painters, in which objects and figures are placed in central positions to express those figures’ world. What began as a project in Usami’s university days, photographing his friends, has become the artist’s lifework – yet it has remained unexhibited for almost twenty years. Having come about by the act of recording those close to him, Usami’s project has now advanced from Hokkaido all the way to Okinawa, and looks set to spread its course even wider in the time to come. 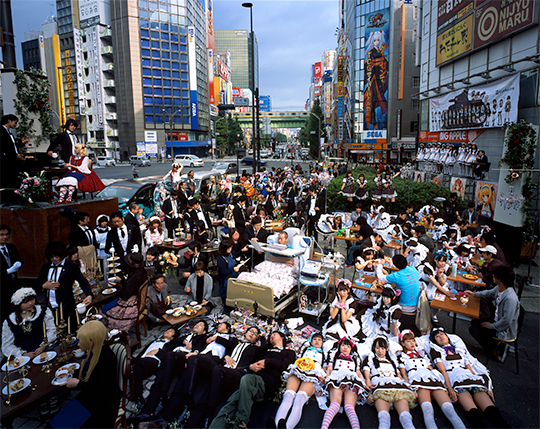 The 2011 Tohoku earthquake constituted a huge turning point in Usami’s work, as it changed from a personal to a societal form of expression. 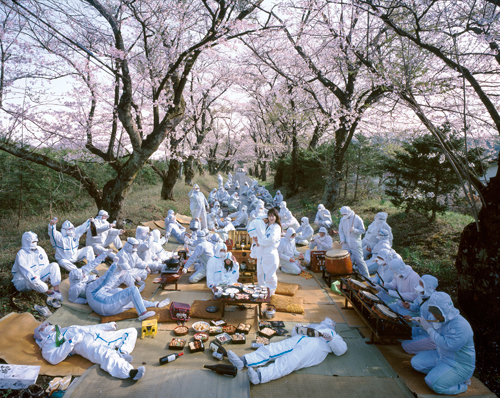 One shot in Fukushima shows some people enjoying hana-mi (blossom-viewing) underneath the sakura trees. This casual scene, which normally unfolds in the same way every year, has its visual landscape vastly altered by the protective clothing its characters have put on to shield themselves from radiation.. It is a landscape in which both *’Hare’ and ‘Ke’ exist in equal proportion. Since the earthquake, Usami has actively visited the disaster sites and researched the region. He has spoken to its current residents and built up a dialogue with them, and begun recording them in his photographs. Sometimes several years are required for a single work to be completed. Above all, what is embedded in these works of Usami is an enormous sense of the temporal axis: Usami has taken care to produce an impression of enfolded time, based on a careful process of continuity throughout the picture. It is as if he has somehow extracted the thrilling moment of an onstage denouement, in direct contrast to the ephemerality of the photographic medium. The images are a microcosm not only of particular individuals, but of society, reflecting contemporary Japan. For this exhibition approximately twenty works will be exhibited, in addition to collected documentary footage taken at the time of shooting recording the artist’s production process.